Can tiny bits of cells in the blood help track the progress of spinal muscular atrophy? Dr. Robin Parks was awarded $150,000 from CureSMA to see if tiny bits of cells called exosomes can be used to track how spinal muscular atrophy (SMA) progresses and responds to treatment. SMA is the number one genetic cause of death in infants. Debilitating and often fatal muscle weakness is caused by a lack of a protein called SMN. It has been suggested that treatment for SMA may be more successful if delivered as early as possible. However, it is difficult to measure whether experimental treatments are working in very young babies without a biological test. Dr. Parks’ team previously found that exosomes naturally released into the blood contain similar levels of SMN protein as the affected nerve and muscle cells. This funding will allow them to continue to explore the practicality and accuracy of analyzing SMN protein levels using exosomes. This research is done in collaboration with CHEO and the University of Missouri. 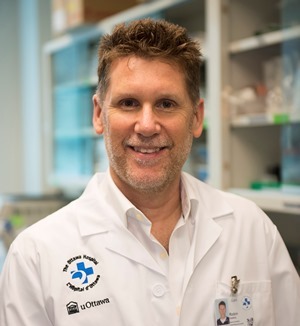 Dr. Parks’ research is possible because of generous support for Regenerative Medicine at The Ottawa Hospital.